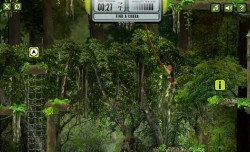 To go with the brilliant kids wildlife TV show “Live ‘n Deadly”, the BBC wanted a major online game. They got Aardman to build it, and I was brought in as part of the team. I worked mainly on the design of levels 2 and 3 (Borneo and California), but also on the core platform engine a little, alongside Mark Burvill and a few others. It was an ambitious project, with a pretty tight deadline. There’s the odd rough edge, but overall it came out pretty well! There were even tie-ins with the show, with the presenters giving out goodies for the game live on air.